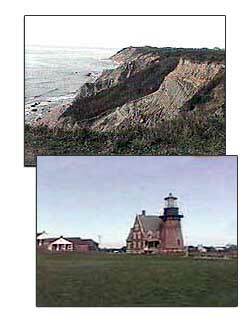 These are some of our pictures of Block Island, RI. Mainly of Mohegan Bluffs, and the lighthouse. We took the Block Island Ferry from Galilee, RI and stayed at a Bed and Breakfast right down the street from the Harbor Inn. We walked to the beaches, ice cream shops, restaurants, and craft shops easily. This is a great spot for tourists, and they have lots of souvenir shops. We took our car over on the Block Island ferry, but it's not cheap and you need reservations during the summer. They have moped rentals so you can tour the whole island. What is the Block Island moped rental fee? You can rent a moped for a couple of hours for fifty bucks. We drove to Mohegan Bluffs, but did not take the stairs down the side of the cliff and don't get close to the edge. The lighthouse is right by the bluffs. Block Island was named by Adriaen Block who was a Dutch explorer in the 1600's. Traveling on his ship he charted almost the whole New England coastline. When he arrived here, the island was loaded with Indians, and they had a hard time settling here. The name of the bluffs came from a battle between the invading Mohegan Indians and the local Manises Indians. The Manises drove a 40-man war party of Mohegans off the cliff to their deaths in 1590.